I am sure that those of you who have prepared fruit preserves or jams, one time or another, found out that their preserves had mildew on top or may be the sugar crystalized. Don’t throw them away as today we are going to learn how to fix these preserves. Preserving fruit is an old Greek tradition dating back to antiquity, to have something at home to offer to guests who visited, as a gesture of hospitality. In the ancient times the fruit were preserved in honey and later when sugar became more popular they started preserving them with sugar. How do I tell if the syrup is ready? Making fruit preserves or jams is very easy provided you know the right technique. This means the amount of sugar added and the consistency of the syrup. 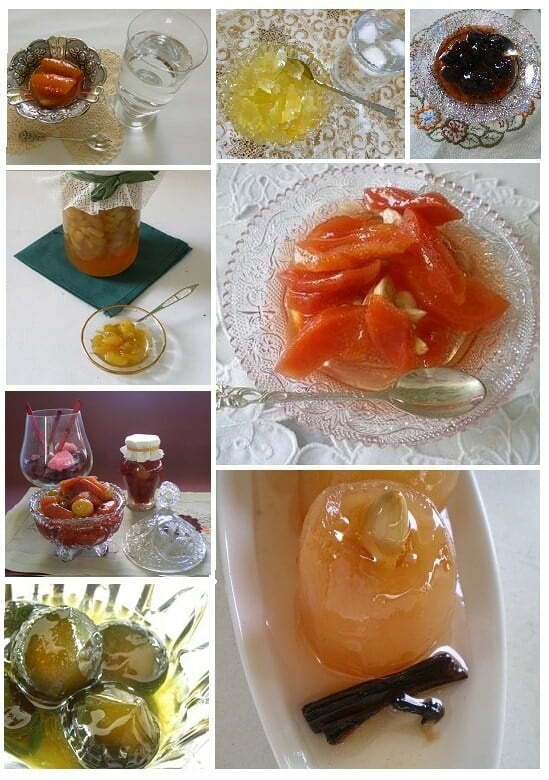 You can make fruit preserves with any fruit and you can make it either when the fruit is unripe, such as Karydaki (young walnut), Nerantzi (green Seville orange), Melitzanaki (baby eggplant) etc or when the fruit is ripe, such as cherries, quince, apple, orange, citrus flowers etc. Depending on the fruit, if it is juicy you don’t need to add too much water to the sugar as the juices of the fruit will be released, making the sugar too watery. On the other hand making preserves with unripe fruit or only the peels of the fruit, such as bergamot, citrus fruit etc. there you will need to add the right amount of sugar. So, when preparing spoon sweets or jams, we must be sure that the syrup is just right, neither too watery nor too thick. Usually if the syrup is not thick enough, if the preserve is left outside the refrigerator it will eventually get mildew. On the other hand, if too much sugar was added and not properly cooked, it can crystallize. The correct amount of sugar will act as a preservative just like salt acts for cured meat, so no refrigeration is necessary when opening a jar. Sugar prevents various microorganisms to develop so no refrigeration is necessary if it has been cooked properly. Older generations did not have food thermometres to know when a preserve was ready. When the temperature reaches 105 degrees Celcius, the preserve is ready. How do we fix spoiled fruit preserves? However, if you have not cooked them properly and see mildew on top, there is no need to throw them away. If your fruit preserves or jams have mildew or if the sugar has crystalized, don't throw them away as these can be easily fixed. Discard all the spoiled fruit, which is always a small layer on top and put it back in a pot. Add some sugar and water, (the ratio is 1:1). Bring to a boil and cook until the syrup sets. Add the lemon juice and let it cool. Store in clean, sterilized jars. If the preserve has crystallized, put it back in a pot and add some water, to bring it back to a liquid condition. Bring to a boil and cook until the syrup has set. Add a tablespoon of lemon juice and turn off the heat. When it cools, store in clean, sterilized jars. I do not mention exact amount because this always depends on the amount you have to fix.